CB and I are off on a trip to Continental Europe. The pilot’s just told us that the wet weather is following us over. According to my weather app, we have approximately half a day of forecasted sunshine in the next four! What happened to Summer? Nonetheless, with the dogged determination of a British Dad barbecuing in the rain, I present you with another summer salad delight. This is a full flavoured, low carb dish which comes together in about 20 minutes. Don’t be tempted to to anything more complex with the dressing – the vinegar and olive oil will do more work here than you’d think. 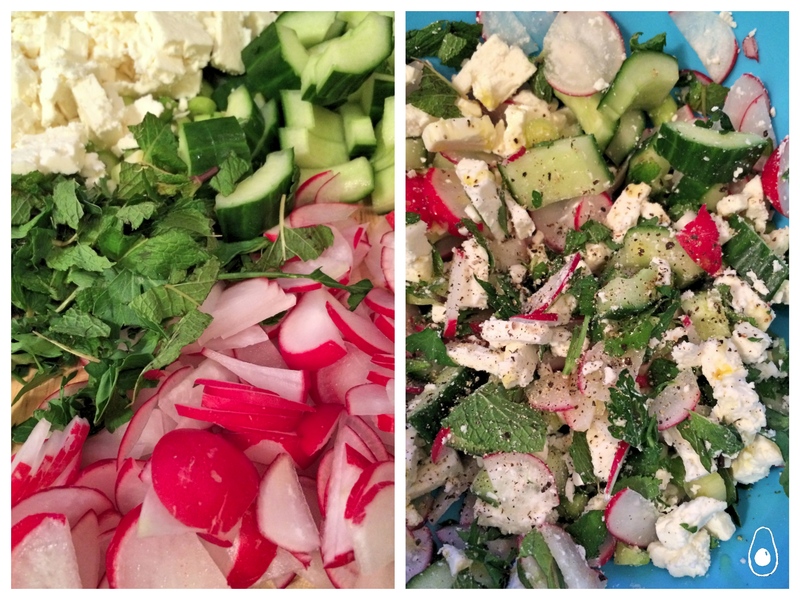 Radishes are a new frontier for us – or, at least I thought they were. Turns out, that’s what those little pink things that come with your Lebanese takeaway are! My advice would be to try and get the biggest radishes you can as you’ll need to slice them quite thinly and dicing baby radishes can take some time. That being said, they are delicious. All of the crunch and the sweetness of a red onion without the antisocial breath afterwards. A final thought: this recipe was adapted from Nigel Slater’s guardian recipe here. In his recipe there is no crayfish and so there was some hesitation on our part before we added a pack of it to the bowl. Crayfish and feta? Was this a match made in heaven or a critical digestive error? And in fact, when did we ever eat seafood and cheese together? We had almost talked ourselves out of it before CB had the epiphany: tuna melt. Our doubts addressed, we pressed on, wine glasses in hand. Slice the cucumber down the middle and scrape the seeds out with a teaspoon. Slice each half in half again, then dice. Add the cucumber to a large mixing bowl with all of the rest of the ingredients up to and including the herb medley. Season well with freshly ground pepper. You can easily exclude the crayfish for a veggie option. Add a good glug of olive oil and the red wine vinegar to taste (we add all 3 tablespoons and then some, but that’s just us). Garnish with the extra mint and enjoy. You resolved that problem very well of whether to add fish or not. 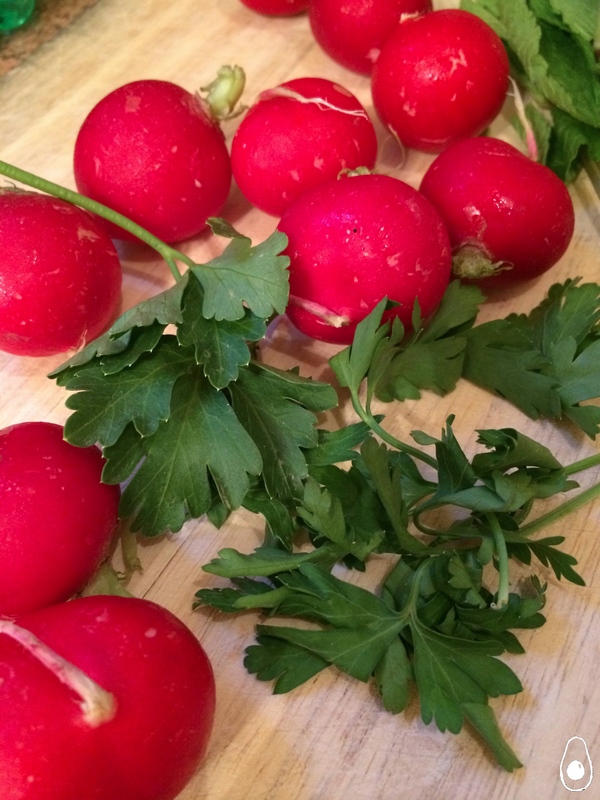 I think these ingredients go so well together, and love the use of radishes, one of the most neglected garden treats. They do need to be paired with just the right things. And frankly, I think this is much better than the classic tuna melt. Thanks for sharing it with us at Fiesta Friday. Radishes really are neglected. Can’t wait to try more with them. Thanks for stopping by!! Italians are usually very skeptical about the fish+cheese combo. I think that there are some cases where they are perfect together. There are no absolute rules in the kitchen, if something works despite what we’ve been thought that means we have created a new tasty dish. 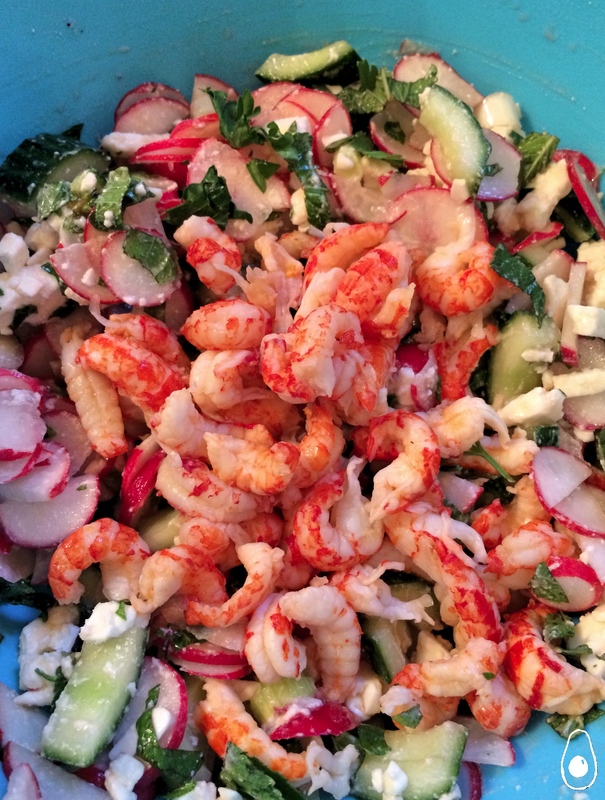 Crayfish is a good choice for a salad and feta is the king (queen? :)) of the salad cheeses. Love the recipe! Thank you for your comment! Yes I was really nervous because the truth is, crayfish is a world away from tuna and feta is a really strong flavour but actually this worked so well – we were really surprised!